SIMPLE LIFESTYLE CHANGES could significantly lower people’s risk of developing cancer, the Irish Cancer Society (ICS) has said. 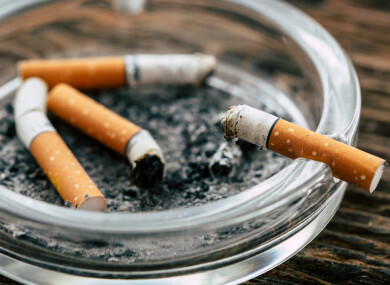 Four out of 10 cancer cases are preventable and 40% of cancer risk has been attributed to five lifestyle factors — tobacco, diet, being overweight or obese, alcohol intake and low physical activity, according to the National Cancer Registry. A recent survey by YouGov, on behalf of the Association of European Cancer Leagues, found that Irish people (13%) are more aware of the code in comparison to their UK counterparts (2%). The survey also found that 78% of Irish people questioned said they were likely to make changes to their lifestyle based on the guidelines. Kevin O’Hagan, the ICS’s Cancer Prevention Manager, said it’s positive to see a “growing awareness of cancer prevention in Ireland”. The number one thing people can do to improve their health and lower their risk of cancer is to quit smoking. Three in every 10 cancers are caused by smoking and we would urge all smokers to make quitting their number one resolution in 2018. O’Hagan said anyone who wants to quit smoking should call the HSE Quit Team on 1800 201 203 or click here for advice and information. He said another way people can reduce their risk of developing cancer is by getting physically active. He said maintaining a healthy weight is the most important thing you can do for cancer prevention, after not smoking. Up to 40% of certain cancers are attributable to being overweight or obese and, with most adults in Ireland now weighing more than they should, it is really important we do all we can to maintain a healthy weight to lower the risk of cancer. O’Hagan added that about 900 cancers and 500 cancer deaths are attributed to alcohol every year. “I would urge people to be aware of how they drink and limit their intake as much as possible. The new year is a great opportunity to change a habit and to radically change our approach to alcohol in this country,” he said. Email “These lifestyle changes could help lower your risk of developing cancer ”. Feedback on “These lifestyle changes could help lower your risk of developing cancer ”.